Hello everyone! 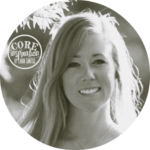 I’m Laura Santos, from Core Inspiration by Laura Santos, and I’m honored to have this opportunity to reach out and share my favorite math routine with you. One of the best (and most challenging) things about teaching math is guiding students in the creation of clear math models and helping them develop the ability to communicate the reasoning behind their solutions. The widely-adopted Common Core Standards for Mathematical Practice call for students to make sense of problems and persevere in solving them, reason abstractly and quantitatively, construct viable arguments, model solutions, and attend to precision, among other math skills. Unfortunately, most district-adopted curricula does not require students to exercise these skills frequently enough to achieve a level of mastery. Yes, they may be able to solve several problems that require subtraction with regrouping, but can they truly articulate the reason why their solutions are correct? If the answer is no, then I have a tool your students can start using tomorrow that will immediately challenge them to develop these essential math skills. I call this tool Write to Explain. 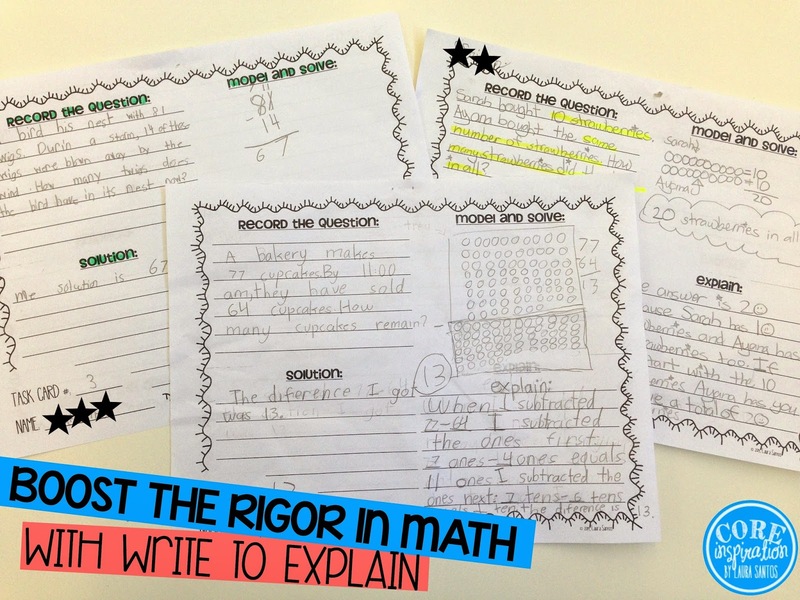 This Write to Explain recording sheet can be used with virtually any math problem, but it is especially handy when it comes to solving hefty word problems that require multiple computational strategies and steps. The format is simple: four boxes that guide students through four steps. The reasoning and analysis process begins. Students are required to attend to precision as they record the math question word-for-word and highlight the most important key words, numbers, and ideas. Students use abstract and quantitative models to work through the problem solving process. Those who are experts at mental math are trained to attend to precision when modeling their thinking. Students record their solution in a complete sentence and routinely double-check that their solution accurately answers the question. Students justify their conclusions and communicate them clearly in written form, further reinforcing their reasoning skills. Of course, most students will give you a “you are crazy” look when you hand them this recording sheet and tell them their solution should fill the whole page (they are used to squeezing answers on a tiny 1-inch line, after all). Fortunately, with a little guidance and modeling from their favorite mathematician, they will be knocking your socks off with beautiful math models and explanations in no time. Sift through a review math unit and pull out a few word problems with which you know your class will feel successful (when introducing a new routine, you want those brain cells focused on the process, not getting hung up on math skills with which they aren’t familiar). On the first two days, have students observe as you solve a problem using the recording sheet and ask them to listen to your think-alouds as you solve. On day three, have students complete a problem with you. Although some of your high achievers may want to hurry off and complete the recording sheet their way, it’s important to work step by step together so the process is deeply solidified. Continue to share your think-alouds as you record and they copy your example onto their own paper. Depending on your class, you may repeat this process for one additional day or for several additional days. When you feel your students truly understand the process, begin to release some of the responsibility. Have them Record the Question and then share with a partner what they recorded and what key words they highlighted. Then, have them Model and Solve and meet up with a partner again to share out. Continue this “work and share” routine until all four steps are complete. As you see your students become more confident and independent, gradually require them to complete more steps before sharing with their partner. As students share pick exemplars to read and display to the class so students build a strong understanding of what a thorough model and articulate solution and explanation look like. 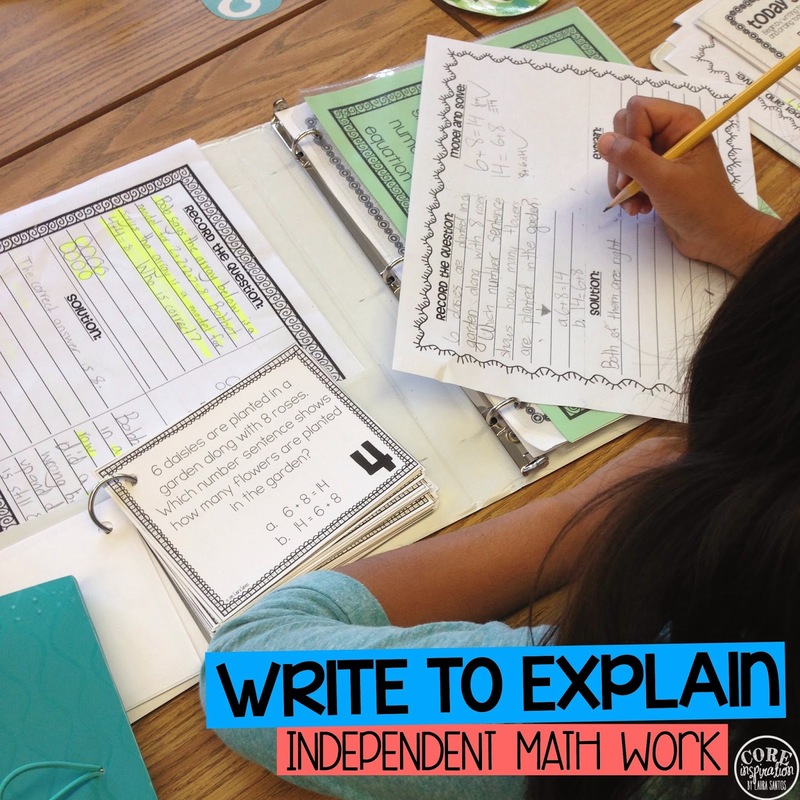 Once this training process is complete, you can introduce Write to Explain as independent work or as partner work that students complete as part of their daily math routine. Although Write to Explain can be used for any math problem, I have created several sets of task cards with questions specifically designed with Write to Explain in mind. 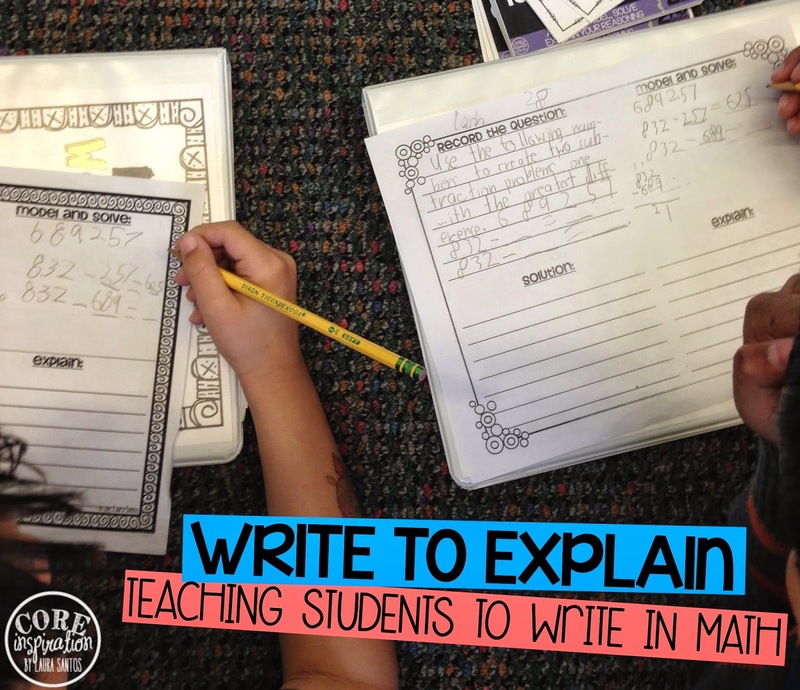 My second grade and third grade sets are available in my TPT store, along with a Write to Explain Task Card FREEBIE that includes the recording sheet featured in this post. Laura Santos, from Core Inspiration by Laura Santos, is a teacher creator with six years of experience teaching grades 2-4. She is currently a second grade teacher and enjoys creating enrichment resources that challenge her active learners. For more inspiration, visit her blog and TPT Store, or swing by her Pinterest, Facebook, and Instagram.